张然, 汤艳清, 魏胜男, 王菲. 伴自杀意念重性抑郁障碍患者的弥散张量成像[J]. 中国医科大学学报, 2018, 47(10): 871-875. ZHANG Ran, TANG Yanqing, WEI Shengnan, WANG Fei. Diffusion Tensor Imaging in Patients with Major Depressive Disorder with Suicidal Ideation[J]. Journal of China Medical University, 2018, 47(10): 871-875. Abstract: Objective To identify specific white matter changes in major depressive disorder (MDD)with suicidal ideation using diffusion tensor imaging (DTI)to compare patients with and without suicidal ideation. Methods Using the Beck 19-item Scale for Suicide Ideation and the 17-item Hamilton Depression Rating Scale, 34 MDD patients with suicidal ideation, 54 MMD patients without suicidal ideation, and 57 healthy controls (HC)were evaluated. All subjects underwent DTI. Results Compared with the HC group, the MDD group with suicidal ideation showed significant differences (P < 0.05)in the genu and splenium of the corpus callosum, cerebral peduncle, superior longitudinal fasciculus, right inferior longitudinal fasciculus, left posterior limb of the internal capsule, and left posterior thalamic radiation. Moreover, there were significant differences (P < 0.05)in those regions between MDD patients with and without suicidal ideation. However, no significant differences (P > 0.05)were observed in the left posterior limb of the internal capsule, splenium of the corpus callosum, and superior longitudinal fasciculus between MDD group without suicidal ideation and HC group. 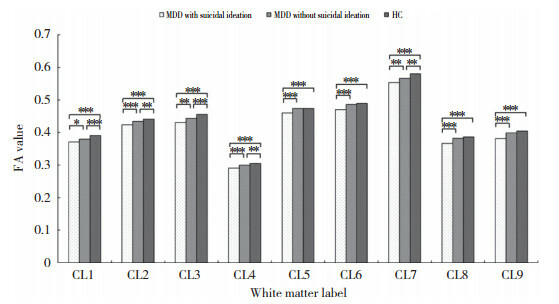 Conclusion MDD patients with suicidal ideation have specific white matter changes, and suicidal ideation may be associated with abnormalities of white matter in the internal capsule, corpus callosum, and superior longitudinal fasciculus.